I think we can all agree—the Texans are off to an embarrassing start this season, already with an abysmal 2-4 record after today’s 38-13 loss to the Rams. There’s been a lot of trash-talking in H-town about our football team, and our quarterback Matt Schaub has borne a lot of the brunt of the fans’ anger as they grumble about his high interception rate. Say what you want about his performance as a professional athlete—what happened today during the third quarter of play was completely unacceptable. After the Rams’ Chris Long landed hard and low on Schaub, he was knocked to the ground, unable to get up. And that’s when things went very, very wrong. Some of our Houston fans actually began cheering when our quarterback went down with a still-undiagnosed ankle injury. As poor Schaub limped off the field and backup QB T.J. Yates came out, the cheers got even louder. Schaub watched the rest of the game from the sidelines with his ankle taped and his spirit no doubt broken. After seeing all this I have to say: come on guys! Yes, Schaub has been playing badly, but he’s still a human being. A human being with a very painful sprained or broken ankle; how can we be cheering over another person’s devastating injury? I wouldn’t do that for another team’s player, let alone our own team’s leader. 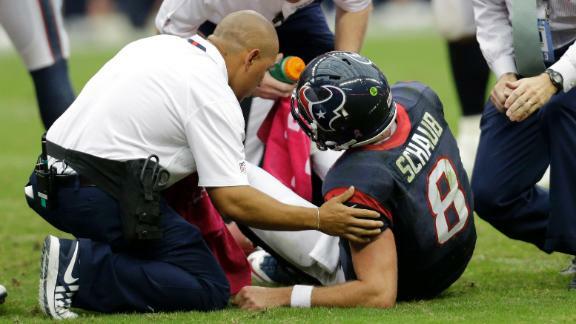 As a Houston podiatrist, I sympathize with Schaub’s pain and wish him a speedy recovery. I also invite anyone experiencing discomfort due to an ankle injury to schedule an appointment in my office for quality care and a sympathetic ear.